For Part 1: see Broderick's post here. For Part 2: see Davina's post here. The Bonded By Blood Vampire Chronicles by Arial Burnz is the saga of Broderick MacDougal following the soul of his true love through the centuries. There are six books planned for the series and this tour highlights the characters featured in the first three books and in the upcoming release Midnight Eclipse - Book 4 - which features Norse shapeshifting pirates. AVAILABLE FOR PRE-ORDER OCTOBER 8TH for VIP Club members, October 15th worldwide. 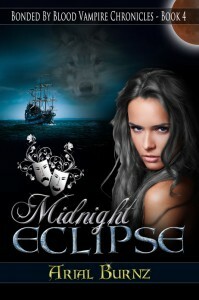 Become a VIP Club Member for FREE to get the VIP pre-order pricing of 50¢ for Midnight Eclipse!! You'll also get Midnight Conquest, Book 1, for FREE if you join. CLICK HERE to read about the other benefits of being a VIP. Click to Tweet and help spread the news! A Gypsy...and so much more! Amice Cartier and Broderick MacDougal crossed paths when Broderick rescued her granddaughter Veronique from drowning at the age of five. Amice was eternally grateful to Broderick, but her sixth senses told her what he was and she, at first, shied away from him. Vamsyrians are not known for their generosity and compassion, so Amice took a chance to become more social with Broderick and invited him to sit by their fire to dry off from the river...and she read his palm. Even then, Amice told Broderick how unique he was, especially amongst his own kind, though Broderick still is not certain exactly how different he is or why. However, the nurturing Amice expressed was something Broderick needed at the time. As a result, he felt drawn to her and accepted her invitation to join their band of traveling vagabonds. Over the years, Amice became somewhat of a replacement for Broderick's mother, Moira. Amice taught Broderick how to perfect his mind-reading abilities granted by immortality, and he learned palm reading in order to compliment his supernatural gifts. 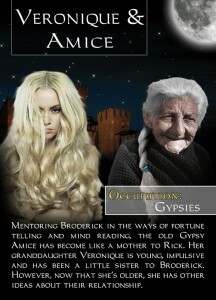 With Amice telling fortunes by day, and Broderick telling them at night, they made a very good team! “You just keep invading my mind and we will see how fiery I can get! I will cast a spell on you, and you…you will fall in love with a chicken!” She nodded emphatically. Veronique Cartier did start out as a cute, young child. Unfortunately, her grandmother Amice spoiled her to make up for the loss of her daughter Monique, and perhaps even doted on her granddaughter as a salve to her guilty conscience for not being able to save Monique from her self-destructive behavior (see below). When Broderick MacDougal came into Veronique's life, he was a larger-than-life, knight in shining armor who rescued her from a watery grave. With an overly affectionate and spoiling grandmother and a rogue of a Gypsy for a male role model, poor Veronique didn't have much of a chance at being a very loving woman. Her upbringing unknowingly produced a very selfish little girl who just wanted to be loved...and she'd do anything to get that love. Such is the stage that is set for Midnight Conquest and Davina's misfortune at having crossed the path of this self-centered Gypsy. Readers will FINALLY get to learn what happened to Monique! Read on...oh, and please Click to Tweet! The life of a Gypsy was all Amice had ever known. Her mother Anna Ribault was a French Gypsy, who fell in love with an aristocrat in Paris. Unfortunately, the nobleman only used Anna for his own pleasures. When Anna told him they would be having a child together, a product of their love, he banished Anna from his presence. This, of course, broke Anna's heart and she acted rashly, exposing the nobleman for his callous behavior. Unfortunately, as a Gypsy Anna was ridiculed and the nobleman's wife ordered Anna stoned in the city square. Anna's Gypsy clan rescued her from the public execution and they all fled Paris. Anna never told Amice who her father was. Amice grew up amongst the French Gypsies, where she eventually fell in love with Maurice Cartier, her childhood friend and one of the Gypsies in her clan. They had a daughter, Monique. Maurice died in a horse riding accident when Monique was just thirteen, so she went into deep despair over losing her father. Unfortunately, that caused Monique to look for the affection of men...who were many, either in spite of or a direct result of Amice's strict hold on her daughter. Monique became pregnant with Veronique - father unknown. Amice ended up rearing her granddaughter due to Monique's obsession with finding someone to love her. Monique's pursuit for romance led her into the bed of a Selkie male named Amund Osvald. Once Monique discovered what he was, she found his seal skin and hid it from him. Though Selkie women are known for being bound to a human male in such a situation, male Selkies are not so forgiving or compliant. No matter what Amice said to get Monique to return the Selkie's skin, Monique refused and was confident she had finally found her true love who could never leave her as long as she always kept the skin concealed. Her hidden treasure would be the death of her. Amund found the skin and killed Monique before he returned to the sea. Veronique was too young to understand what happened to her mother and thought Amund had taken her mother with him to the sea...so she went into the river looking for her mother. And that is how Broderick saved Veronique from drowning. Broderick MacDougal follows the familiar yearning of his soul to a fierce warrior who is as seductive as a siren at sea - and she is just as deadly. The world of the supernatural opens to Broderick as he not only finds himself in the midst of an ancient war of shapeshifters, but the devious Cordelia Lynn Harley has re-entered his life and has a few of her own surprises. Born into a hated race of Norse wolf shifters, Celina Hunter knows all too well the dangers of trusting anyone other than her two brothers. And yet the survival of her family hinges on trusting the strangely familiar vampire, a natural enemy of her kind…yet her tribe’s Shaman advisers confirm he is her soul mate. Enemy or not, Celina slips into the spell of Broderick's promises of eternal love, gambling with all she holds dear. 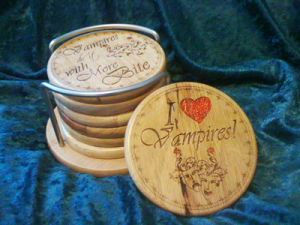 Arial Burnz has been an avid reader of paranormal and fantasy for over thirty years. With bedtime stories filled with unicorns, hobbits, dragons and elves, she succumbed to crafting her own tales, penning to life the magical creatures roaming her dreams. Having a romantic husband who's taught her the meaning of true love, she's helpless to weave romance into her tales. Now she shares them with the world. 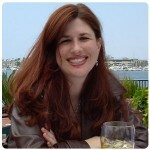 Arial Burnz lives in Southern California, with her husband (a.k.a. her romance novel hero)—who is also, quite coincidentally, a descendant of Clan MacDougal.